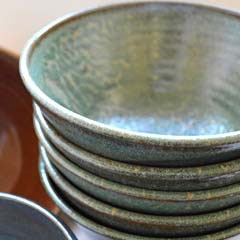 Features this year include more than 100 beautiful bowls donated by talented Maine potters; bread donated by the Back 40 Bakehouse; soup made by Cheryl Wixson of Cheryl Wixson’s Kitchen and featuring donated Maine organic ingredients from MOFGA-certified organic Happytown Farm and Rabbit Hill Farm; and drinks and more donated by the Belfast Co-op Store – all for just $15 ($35 maximum for families). New this year: Belfast potter Russell Kahn will have a portable wheel where you can try throwing a clay pot to take home and air dry. Enjoy, too, the music of Orland-based Happytown. Please join us at 6 p.m. on April 30 at the Unitarian Universalist Church on Miller St. in Belfast. Tickets will be available at the door. FMI: MOFGA.org.